Yep, call us spoiled, or call us lucky to have friends from the most amazing parts of the world. Mike and I were SO happy to have an excuse to go to Italy the second summer in a row. 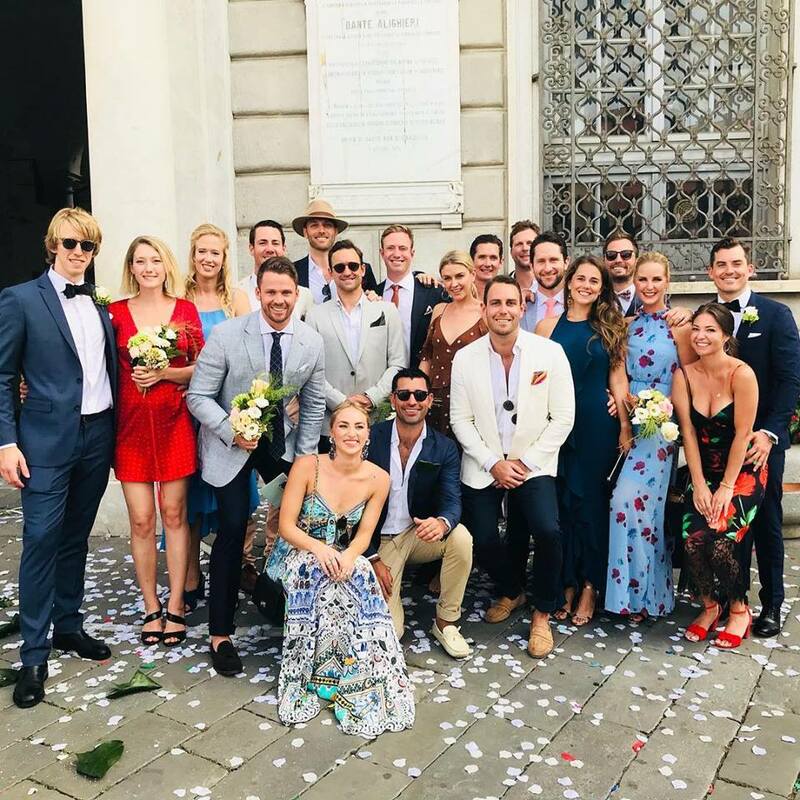 This time, it was for our friends, Ric and Lucia's, wedding in the beautiful Cinque Terre which is near where Lucia grew up. Mike had the brilliant idea to make a pitstop in Sweden on our way over to visit my good friend Pia who just recently had her second baby as well as one of Mikes friends who lives in Denmark...2 birds 1 stone! As I've said before, I'm a terrible writer, so this will mostly be pictures and the names of places we went to and recommend. For those who don't know Italy very well, Cinque Terre (also known as 5Terre...get it?) is kind of like the Amalfi Coast of the north. Still on the west coast and along the shore, with colorful houses built into the cliffside. Absolutely breathtaking, all of it. I wish I had more photos of their beautiful home in Helsingborg, but this was taking the day trip before our flight to the famous houses in Nyhavn in Copenhagen! This place was SUPER hoppin' and lively, honestly cooler than I ever expected. Worth another (longer) trip back! A quick night and day and we're off to Florence for the grooms Bachelor party! Mike booked our hotel on points and we had NO idea how nice it actually was until we got there and the concierge took us up to open our "balcony". We stayed at The Westin Excelsior and it was STUNNING. Check out our view from said balcony. We started off exploring the day with friends who showed up early as well to see some of the below attractions and sites. Ummm HI, are you kidding me?? Next we were off to where we were staying until the rest of the trip in Tellaro! But first, we had to stop in Pisa to see the famous leaning tower...you can't drive past it and not stop in. We arrived at our house and it was BEAUtiful. As soon as we drove down this tiny one way road and saw we needed a remote to open the gate, we knew we were in for a treat. Apparently it used to be an old poets house which you can tell by the marble engraved with his own personal logo, outdoor wood-fire pizza oven and the elevator (which you HAD to use, there were actually no stairs to get to the second floor). We had about 20 minutes to take a tour and get ready though cause it was the girls turn to party! Lucia's bachelorette did NOT disappoint. A sunset cruise followed by a proper Italian beach/night club that was SO MUCH FUN. Fun story: We told the guys about the night club and the single ones got all excited about it so they made sure to make a special trip the following night to get all dressed up and go there only to find out when they showed up that it was an "under 18" night and were turned away haaa hahah. The next day the bride and groom had planned a boat ride to take us around 3 of the 5 villages in Cinque Terre. Unfortunately that morning we were told that the water was too choppy and they had to cancel the boat. BUT, european trains never cease to fail. I believe there was about 20 of us, all trying to figure out the ticket system and hopping from train to train around the coast of the Italian Riviera. First stop, the classic Manarola. This is the one where you see the iconic photo of all the colorful houses on the cliff. We got to jump in the super crisp and refreshing blue water and then found a place outside that fit all of us for lunch called Ristorante Marina Piccola. It had one of the best squid ink pastas I have ever had (honestly that black pasta usually freaks me out) and plenty of aperol spritz' to go around (our go-to drink of the trip, as you do in Italy). That last photo is my favorite. 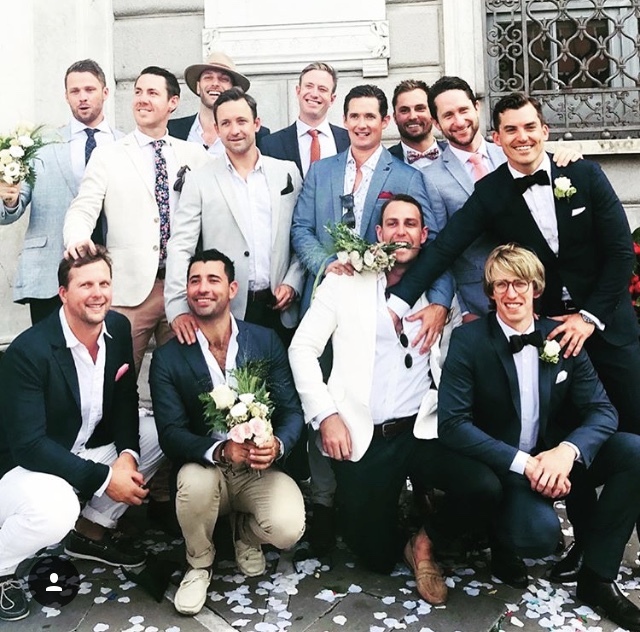 #boyfriendsofinstagram ....note Mike off the right staying strong. Next up, Vernazza. We walked around and shopped in all the tiny little stores that lined the main road and stopped for a much needed cappuccino. The following days before the wedding were spent exploring the towns and beaches around us, also known as the Gulf of Poets. From discovering tiny beaches, the walking along the coastline to different towns for the perfect pizza/pasta combo, there was plenty to do and see. Another place we went to that I would hiiiiiighly recommend is La Burlanda. It's a Farm to Table restaurant where they grow almost all of their products and make their own oil and wine on the estate. Not only was the view gorgeous but it was a 7 course meal with enough cheese and meat to put you in a coma. Sad to have had to leave the next day, but we'll be sure to be back! Italy means so much to Mike and I and we have so much more of it to see and explore. Until next time!